You can choose a custom sized rug or a standard size option. This guide will show you how different room configurations call for their own ideal area rug size and shape, be it a standard 2x3, 9x11, or a custom round. Whatever look and feel, room function, and furniture layout you’re going after, we’ve got the perfect rug waiting for you! What size rug do I need for my living room? Both 6’X9’ and 9’x12’ are standard rug size selections for the living room. Depending on the size of the room and furniture configuration, a custom area rug might be the better option to allow for appropriate spacing in inches on and off the rug. If your sofa and armchairs are against the walls, the rug size you need should go under the front leg of all large pieces (red outline) or, if you would like more of your floor to show, small enough that none of the furniture legs overlap it (lavender outline in the rug size guide). If your furniture is floating in the room, the ideal rug will be big enough to go under all four legs of each large piece (red outline) or again, if you prefer to see the floor, small enough that none of the seating pieces sit on it (lavender outline). Smaller rugs can be used under a coffee table or to define a seating area. You’ll find a great selection of standard sizes in our ready-made area rugs shop. How to measure runner size for hallway? When measuring your runner size, keep in mind furniture should rest on the bare floor. A long central runner can be used down the center of a hallway with furniture and accent pieces placed either on both sides or along one focal wall. Widths can range from 2’ to 3’ and lengths can require 9’ or more in length. Our large inventory of runner rug sizes as well as our custom sized rugs allows you to find or design the perfect rug for your unique space and configuration. What size rug will fit best in the kitchen? In a busy kitchen a small 2’x3’ rug placed in front of the sink is ideal. If you have a galley kitchen or center island a 2’6”x8’ decorative runner can fill up the space nicely, while providing a nice cushion underfoot. 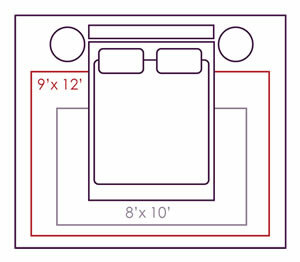 Additional standard sizes often used in a kitchen are 4x6, 5x7, and runners can be 12’ or more if you’ve a large traffic area. What size should a dining room area rug be? When sizing for the area under a dining room table, make sure to maximize your rug so that your table and chairs clearly stay on your rug. You will need at least 24” beyond the table on all sides to accommodate your chairs when pushed out. For a smaller room, the front legs of your chairs should stay on the rug 6" when pushed out. Follow the same rules for sizing a rug under a round table, usually 8’ round or larger. Ideally a bedroom rug should extend about 36” around the sides of your bed. As a general guideline, standard rug sizes are 8’x10’ for a full or queen bed and 9’x12’ for a king. Alternatively, runners on both sides of the bed are a great option providing a cozy feel underfoot. These are usually 2’ or more in width and up to 8’ in length. Can’t find the rug size you need? Create your own custom area rug. 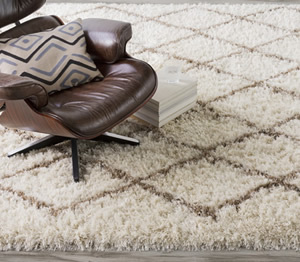 Your perfect rug can be handcrafted for your unique space from our large selection of designer materials.